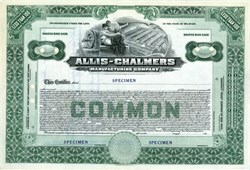 Beautiful specimen stock certificate from the Allis - Chalmers Manufacturing Company printed in 1912. This historic document was printed by the Hamilton Banknote Company and has an ornate border around it with a vignette of two allegorical figures viewing a factory down below them leaning on an electrical generator. This item is over 105 years old. Allis-Chalmers started out as a small burr millstone maker in 1847. By 1979 they had grown into a $2 billion corporation and were one of the important machinery manufacturers in the United States. The original company, known as "Edward P. Allis & Company" was built by E. P. Allis of New York after acquiring a shop called "The Reliance Works". The Reliance Works' list of products included French burr millstones, portable mills, water wheels, shafting, hoisting screws and much more. In 1869 the company expanded into steam power and soon after followed the first Allis steam engine. The company line-up grew to include steam pumps including the largest centrifugal pump in America in 1884 and the first triple expansion pumping engine two years later. Twelve years after the death of Edward Allis, the company merged with Fraser & Chalmers Company, Gates Ironworks and the Dickson Manufactring Company. these mergers led directly to the forming of the Allis-Chalmers Manufacturing Company in 1901. Allis-Chalmers built its first farm tractor in 1914. The tractor business grew, and in 1928 a line of crawler tractors was started. The acquistion of several additional companies in the upcoming years, such as the LaCrosse Plow Company and Advance-Rumely added an extensive line of tillage implements, threshers and combines to the line-up. The Allis Chalmers Manufacturing Company acquired the Allis Chalmers Company in 1913. At the time the owned the Dickinson Manufacturing Company, Scranton, PA; Fraser and Chalmers, Inc., and Gates Iron Works, Chicago, IL; and E P. Allis Company, Milwaukee, WI. and Controling interest in the the Bullock Electric Manufacturing Company. The company manufactured mining and milling machinery, turbines, farm tractors, engines and electrical apparatus. Over the years Allis-Chalmers was responsible for many innovations in farm equipment and grew to become one of the largest and most diverse manufacturers in North America. However, Allis-Chalmers became the victim of rapidly changing financial times and was eventually forced to sell the farm equipment division to K-H-Deutz AG of Germany in 1985. Duetz sold to AGCO inc. in 1990. AGCO is a leading manufacturer and distributor of agricultural equipment throughout the world. The Company sells a full range of agricultural equipment and related replacement parts, including tractors, combines, hay tools, sprayers, forage equipment and implements, and additionally, a wide array of advanced technology for precision farming. The Company's products are widely recognized in the agricultural equipment industry and are marketed under the following brand names: AGCO, Massey Ferguson, Challenger, Hesston, White Planters, GLEANER, New Idea, AGCOSTAR, Tye, LO*RAL, Farmhand, Ag-Chem, Glencoe, FENDT, Spra-Coupe, Fieldstar, SOILTEQ and Willmar. The Company distributes its products through a combination of over 7,350 independent dealers and distributors, associates and licensees. In addition, the Company provides retail financing in North America through AGCO Finance and through Agricredit in the United Kingdom, France, Germany, Ireland, Spain and Brazil. AGCO was organized in June 1990 by an investment group formed by management to acquire the successor to the agricultural equipment business of Allis-Chalmers. Since its formation in June 1990, AGCO has grown substantially through a series of 19 acquisitions for consideration aggregating approximately $2.3 billion. These acquisitions have allowed the Company to broaden its product line, expand its dealer network and establish strong market positions in several new markets throughout North America, South America, Western Europe and the rest of the world. The Company has achieved significant cost savings and efficiencies from its acquisitions by strategically controlling inventory, eliminating duplicate administrative, sales and marketing functions, rationalizing its dealer network, increasing manufacturing capacity utilization and expanding its ability to source certain products and components from third party manufacturers.